Does your restaurant have sufficient bandwidth? By now, restaurant owners know they need to offer more than great food and friendly service if they want to succeed in 2017 and beyond. They need to offer support for the latest technology as well. From the ubiquity of smartphones to the emergence of the Internet of Things (IoT), technology is changing the way consumers interact with businesses and the way businesses are managed. 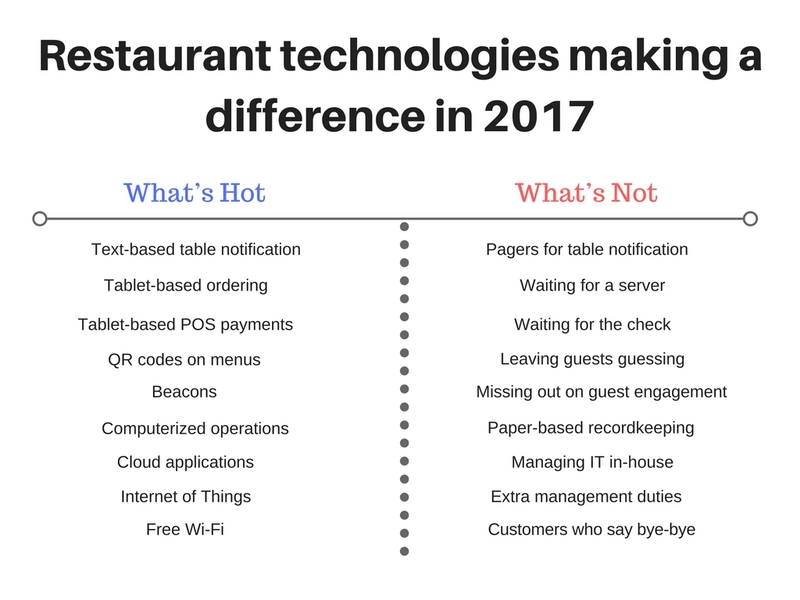 Consider some of the ways new technologies will change the restaurant experience in 2017 for owners and guests alike. In 2017, more restaurants will replace pagers with text-based notifications that send messages to diners’ smartphones when their table is ready. Once restaurant owners obtain a guest’s phone number, they can (with permission, of course) add them to a customer relationship management system to send out promotional texts, coupons and other special offers to encourage repeat visits. 2017 will also see an increase in the number of restaurants allowing patrons to order their meals using tablets or other digital devices at their table instead of waiting for a server. The order is placed to the kitchen immediately and accurately, reducing delays and errors. When the meal is over, servers equipped with mobile point-of-sale devices let patrons pay and receive their credit card receipt in an instant. More dining establishments will be adding QR codes to their menus or table cards in 2017 to provide additional information, such as nutrition facts or suggested wine pairings. Some are using QR codes to send patrons to a site where they can sign up for frequent diner programs or birthday clubs. Beacon technology has the promise to change the way restaurants market themselves and cater to guests. These tiny devices use a smart phone’s bluetooth signal to connect it to a mobile app that pings the smartphone each time it is nearby, regardless of whether the app is open or not. Beacons can be used to send marketing messages, alerts for special offers, notifications of current wait times for tables and guest surveys. They also provide restaurant owners with valuable guest behavior analytics. Smart restaurant owners will also implement new back-of-the-house technologies in 2017 to help them run leaner and increase revenue. The days of paper-based record keeping and management functions will soon be over. Cloud-based data storage and applications — which can be accessed from anywhere on any device — make it easier to manage day-to-day operations and grow a business without having to worry about IT infrastructure and capacity. And the IoT has the promise to revolutionize the way owners manage everything from inventory and staffing to refrigeration and HVAC. Wi-Fi is the key enabler of new technologies. Practically ubiquitous in coffee houses and fast-casual restaurants, Wi-Fi availability is extending to fine dining establishments as well. Separate public and private Wi-Fi networks can ensure fast and secure connections for both guests and operations, even when running complex applications or during surges in guest use. Today, many restaurants don’t have the bandwidth to support the heightened demands of technology and guest users. It makes sense when evaluating service providers to look for reliable, secure connectivity and Wi-Fi that can be adjusted for growth and new technologies. Robert Irvine is a chef, entrepreneur and Comcast Business brand ambassador.